At ninth level the entire color of the Town Hall changes to dark gray with a red flag on the top. An entrance into the Town Hall from the roof appears, similar to the one on the Level 5 Clan Castle. A small watchtower appears on the top left, and there is a new extended red entryway leading into the Town Hall, flanked with two gold chains. There is also a skull added as a door design. If noticed carefully, both front corners of the Town Hall have carved Level 7 Walls. 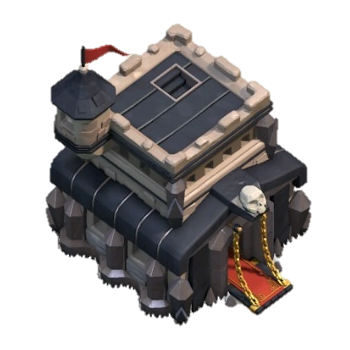 At Ninth level the Town Hall has 4,200 , the upgrade cost is 3,000,000 and last for 10 days. After finishing of the upgrade You will get the Experience: 929 . At this Level the Town Hall can store the following maximum amount of Resources: 1,000,000 , 1,000,000 and 10,000 . 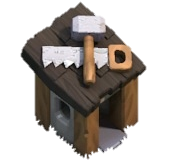 Ninth level of the Town Hall allows you to build 13 additional Buildings (Total is 101, including the Town Hall itself, Traps and 5 Builder’s Huts). The number of available sections of the Walls is increased by 25 (Total is 250). The most expensive upgrade for Elixir at this town hall is Dragon level 4 for 7,000,000 . The most expensive upgrade for Gold is X-Bow level 3 for 7,000,000 . The most expensive upgrade for Dark Elixir is Archer Queen level 30 for 150,000 . There are 7 elixir and gold collectors. What about bomb tower anyone know? Wizard lvl 6 is available at townhall 9 now. Thats not true, lvl 5 minions is correct for th9. Also Skeleton spell and dark spell factory lvl 4 is now available for th9. Do you know the max level of the skeleton spell for TH9?